BABYLON, NY General contractor Stalco Construction, Keller Sandgren Architects, structural and mechanical/electrical/plumbing/low voltage engineer The LiRo Group, and the New York State Metropolitan Transportation Authority (MTA) have completed the construction of the Long Island Rail Road’s (LIRR) new, 3,000 s/f Wyandanch Train Station. LIRR is the busiest commuter train system in the country. Ridership on the Ronkonkoma Branch, of which Wyandanch is a part of, has doubled over the past 25 years, necessitating extensive upgrades. 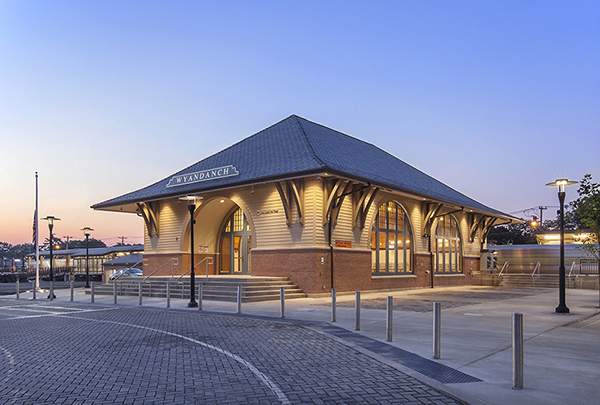 The Wyandanch Train Station services more than 4,000 passengers daily. The new station is part of two initiatives: Wyandanch Rising, a program that aims at improving the 11,000-resident, economically distressed hamlet of Wyandanch; and the Double Track Project, which added a second track to the LIRR’s Ronkonkoma Branch, increasing service reliability. The $431 million Double Track Project, completed more than one year ahead of schedule, is part of an unprecedented $6.6 billion investment by Cuomo to modernize the LIRR. The development of the new station was initiated by the Town of Babylon, which incorporates Wyandanch, as part of Wyandanch Rising. The program began in 2002 as a $500 million public-private downtown redevelopment effort to develop a 40-acre zone adjacent to the Wyandanch LIRR tracks into a walkable, family-friendly community. So far, the revitalization has included the construction of new apartment buildings, retail, an ice-skating rink, a spray park, a botanical garden, a 920-space LIRR parking garage for commuters, and infrastructure upgrades. Stalco has served as general contractor on other projects as part of Wyandanch Rising, including the above-mentioned 14,400 s/f, $10 million Geiger Lake Memorial Park Spray Playground and Pavilion, the largest municipal water park on Long Island. In addition to the structural design work as well as mechanical, electrical, plumbing, and fire-protection systems engineering for the new train station, LiRo also provided construction inspection services for the LIRR’s Double Track construction. Familiar with local architectural aesthetic and traditions, Keller Sandgren wanted the new structure to refer back to the great railroad architecture of the late 19th century. Ultimately, they took a page from Henry Hobson Richardson, known as the father of Romanesque Revival. Richardson, most notable for Boston’s Trinity Church, also designed numerous railroad stations and municipal buildings. Robert Paxton, Keller Sandgren’s project manager, explained that Richardson’s work inspired both the interior and exterior elements. “The exterior materials related to Richardsonian Romanesque in part through the brick, which is on the lower portion of the façade, with PVC clapboard siding above that, and faux-slate shingled roofing, all of which also mesh with the local residential style,” he said. A Richardsonian overhang roof reflects the Wyandanch Rising design guidelines. The overhang features supporting framing that’s reminiscent of traditional 19th century train station framing. Highly visually appealing, over-height storefronts and windows add to the charm of the exterior. Stalco project manager, Ken Coenen, noted that passengers are welcomed inside the station by a striking terrazzo floor. “MTA Arts & Design commissioned the custom artwork, which was incorporated into the terrazzo floor. 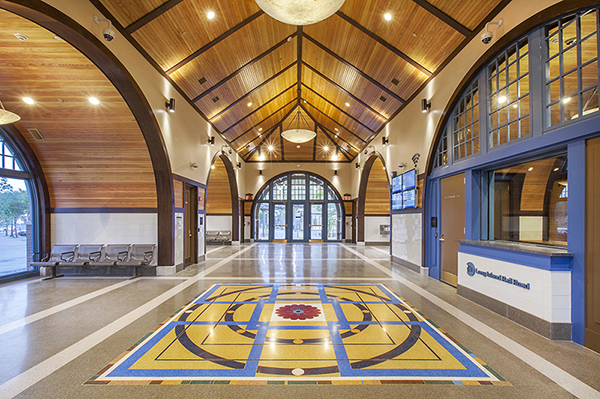 The crews replicated the geometric design in bold colors in the center of the station,” he said. Meanwhile, tiled areas on the walls and the ceilings draw the eye with beadboard that has a clear finish and dark trim. A large, comfortable lobby/waiting area features metal benches, Wi-Fi, abundant cell phone charging stations, and public restrooms. “Rounding out the facility are a mechanical room with heating and air-conditioning equipment, an IT room, a communications room, and a fire-protection room,” said Stalco assistant project manager Adele Todisco. The structure is fully fire-protected with sprinklers and fire alarms. The interiors feature six niches nestled within barrel vaults and accompanied by dramatic arched windows, as well as the above-mentioned central cathedral-style ceiling. The main lighting fixtures inside the station are inverted, partially globe-shaped pendants, with the open side facing up, rather than down. In this way, light highlights the dramatic barrel and cathedral ceilings. Light is then filtered down by gray and gold stained glass, which ultimately provides a warm glow. While the LIRR wanted the station to be aesthetically pleasing, it also insisted that the building be easy to maintain. To this end, some of the interior walls feature oversized, off-white subway-style tiles, metal benches, aluminum framing for the storefront windows and entrance, and the terrazzo flooring. The LIRR had many functional requirements that the architects had to accommodate, with The Agency providing statistics for size, based on the number of passengers the station must serve comfortably. In addition, the exterior organization of the station had to work with the large open public plaza that it faces, along with a pick-up and drop-off loop located between the station and the plaza. Sculptures and a fountain in the plaza, by the main entrance on the north side, make the station highly visible and inviting. As the double track construction was taking place simultaneously by a different contractor in the area surrounding the Wyandanch Station, this created some logistical challenges.